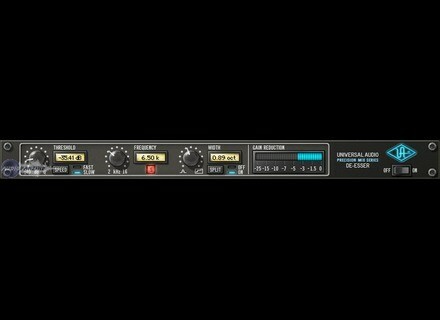 Precision De-Esser, Software de-esser from Universal Audio in the UAD Plug-In series. loudfunk's review"Got sibilance? Get this..."
The Precision De-Esser seamlessly and accurately removes sibilance from in- dividual audio tracks or even composite mixes via its intuitive interface and sophisticated yet transparent filter processing. The Threshold knob dials in the amount of sibilance reduction, while the two- position “Speed” button gives control over the envelope (attack and release) of the detector. The Frequency knob sweeps a continuous target frequency range from 2-16 kHz, allowing repairs on a large range of voices (or even overheads and hi-hats), while the Solo button allows the user to isolate and monitor the target sibilant frequencies. The Width control offers a variable 1/6 to 1 2/3 octave bandpass filter that is perfect for complex program ma- terial, adapting technology from the TEC-nominated Precision Multiband. The Width control also switches into a more traditional highpass filter more com- monly employed when tailoring individual voices. For even greater transpar- ency, the Split feature gives the user the option to compress only the sibilant range, or may be turned off to compress the entire spectrum for more tradi- tional de-essing. Threshold controls the amount of de-essing by defining the signal level at which the processor is activated. Ro- tate Threshold counter-clockwise for more de-essing. Signals peaks as determined by Frequency and Width that exceed the Threshold level are compressed by a ratio of 7:1. 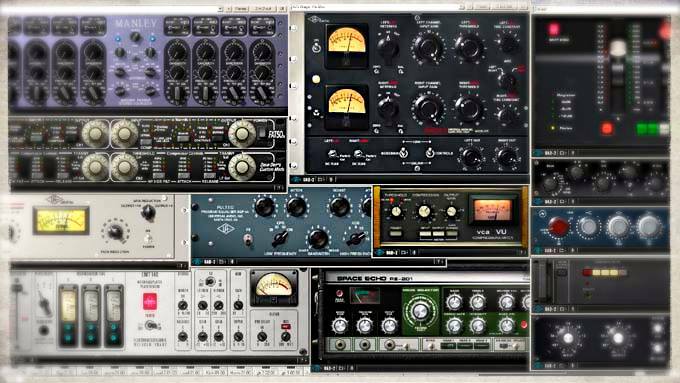 Split determines if attenuation (compression) is applied to the sidechain signal only, or to the entire audio signal. Generally, female “ess” and “shh” sounds vary more in frequency than those of males. Due to this situation, you may find that using the sidechain filter in Highpass mode (or Bandpass mode with a large width) may be more responsive. For taming sibilance for a full mix/mastering, best results will usually be ob- tained by enabling Highpass and Split modes. Over de-essing can degrade the natural sound of a vocal. No pb runs as UAD-1, which is the very stability. As usual after purchase on the website of Audio U., it downloads a few kb file and double-clicking, which allows instant plug! Total time 5 minutes and it works! Others should really take a leaf! For me, a De-Esser is crucial, because my voice has a lot of hissing, and my microphone (AKG C414 XLII) does not help! So I tested a lot (in soft, eh! ), Including Waves Renaissance Waves DeEsser especially DeEsser, the best to date ... Until I buy it, persuaded by the opinions of passionate users: indeed, he gently pushes all the others. It is practical, comprehensive (split), and especially it is effective but remain natural. Although we set does not hear! Takes up little resources of the card, no problem to use. I was a fan of spitfish functioning properly, but that of the UAD is a treat to vote. it is equally effective for softening up the spectrum on some sounds sometimes aggressive on this frequency range. I am completely satisfied with my choice and do it again without hesitation!